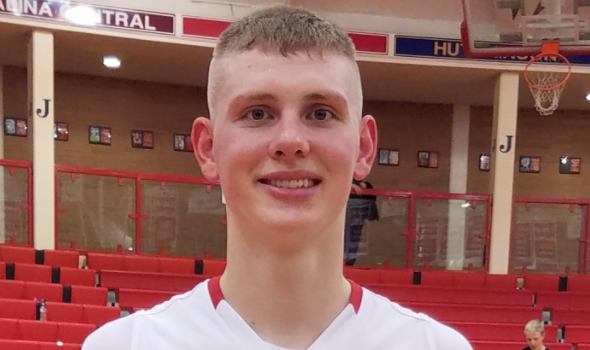 2018 All-Classes & 4A-I Sports in Kansas Player of the Year – Ben Pyle, McPherson, 6-8, Sr.
Pyle, a Western Illinois commit, is the all-time leading scorer and rebounder in the storied history of the McPherson boys’ basketball program. Pyle tallied 22 points in a 57-54 loss to Bishop Miege in the state title game. Pyle, able to play all five positions, helped McPherson finish 22-2. He averaged 22 points, eight rebounds and five assists a contest. He averaged at least 15 points a game in his last three seasons. In his career, Pyle finished first and then had three straight runner-ups to Miege. In addition to Pyle being named first team all-state all classes so was senior teammate Mason Alexander. Junior teammate Jake Alexander was named to the second team in 4A-I. McPherson High School would like to congratulate Taylor Robertson, Ben Pyle, and Coach Strathman on picking up postseason player and coach of the year honors from Sports in Kansas. Congrats to all of the Bullpups for outstanding seasons in 2018! The McPherson Booster Club is a proud supporter of Sports in Kansas and would like to congratulate the Bullpups on another great season. Congrats to all of the players and coaches who picked up postseason honors this season!